It is an amusing novelty for visitors to Uzbekistan that a carrier bag is needed to haul around amounts equivalent to just a few dozen dollars. For Uzbeks, however, it is a major and perennial inconvenience. So many will have been happy to hear a Central Bank announcement on August 14 that a 50,000-sum note is to enter circulation as soon as next week. The new note shows storks in flight over a well-known monument on Tashkent’s Independence Square. The note also features an image of the Forum Palace, a building erected in 2009 with the involvement of the late President Islam Karimov’s eldest daughter, Gulnara. So just how much is this new note worth? Economist Yuliy Yusupov suggested not getting too excited. “This 50,000 note is less than $10. You can’t exactly call it big. It is long past the time to issue a 100,000 note. What notes in this kind of denomination tells us is that official figures on inflation are simply imaginary,” he told EurasiaNet.org. Yusupov said that he was confident that the new denomination will not, as some are predicting, lead to yet further inflation. It will simply make people’s lives easier and save on the government’s paper and ink bills, he said. The Central Bank only brought the 10,000 sum ($1.4) denomination into circulation in February. 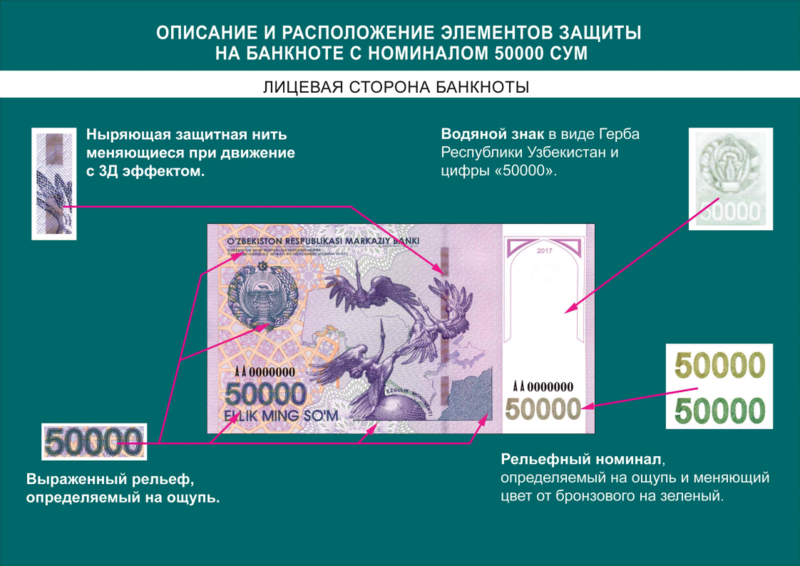 Back in Karimov’s day, the largest note was a 5,000 sum, which came into circulation as long ago as July 2013. While there are also 500 and 200 sum notes, the most common and useful note are the 1,000s, which market traders accurately count at speeds that boggle the minds of visiting foreigners. The low value of the banknotes have generated their own brand of forbearing humor. It is often said, for example, that the government has long resisted bringing in high-value denominations as a way to discourage bank robbers. Not that this has always worked though. In April 2016, a gang in the Khorezm region, around 1,000 kilometers west of Tashkent, hit a bank and got away with 45 sack-loads of cash worth a total of 16 million sum. Two minibuses were needed to cart away the booty. It was still a miserable haul — around $2,500 at the black market rate. If the gang wants to hit pay dirt, they should probably wait until early next year, when it is rumored the 100,000 sum note will make its appearance.